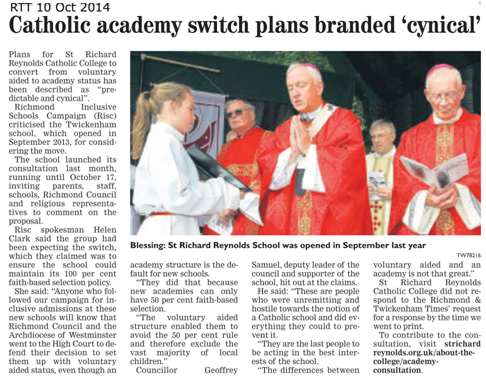 In 2011-2012, Richmond Inclusive Schools Campaign (RISC) fought a battle for fair admissions at a new 150 pupil/year Catholic secondary in Twickenham. The battle ended in the High Court, where RISC and the British Humanist Association obtained a judicial review of the local council’s decision to provide a valuable site for the Voluntary Aided (VA) Catholic schools, rather than seeking applications for a Free School/Academy, which is supposed to be the default structure for new schools. That was important because new faith-based Free Schools/Academies can ‘only’ have up to 50% faith-based selection. The Diocese insisted on a VA structure because they wanted up to 100% faith-based selection, and the 50% limit does not apply to VA schools. Unfortunately the Department for Education intervened to support the Council’s position and the case was lost. The VA schools opened in September 2013. As expected, they are over-subscribed and the secondary is effectively closed to the 90% of local children whose parents are not Catholics, even if they live across the road. It is, of course, state-funded. RISC predicted back in 2012 that, having opened as VA in 2013, the school would convert to Academy status shortly afterwards, securing even more state money, while retaining its discriminatory admissions. It can get away with that because an existing (as opposed to new) VA school that converts to an Academy is allowed to keep its admissions policy. In fact RISC obtained under a Freedom of Information request a Department for Education document dated December 2011 implying the Diocese and the DfE planned to use this loophole all along. For further information or comment please contact Richy Thompson on 020 7324 3072 or email info@fairadmissions.org.uk.